Zoom into first words with colourful vehicles! 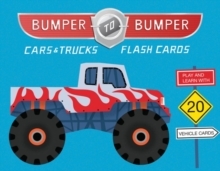 Twenty flash cards in the shapes of a school bus, fire truck, taxi, doubledecker bus, garbage truck and more will delight young children who love all things that go vroom-vroom! Printed on thick, sturdy board, the cards are perfect for play and decorating a child's room.